Six ways to think about an "infinite canvas"
How would content look, feel and act in an unlimited space? Next week, I’m speaking at the Books in Browsers conference on “the infinite canvas.” When I started chewing on this topic, my thoughts centered on a very literal vision: a super-ginormous sheet for authors to compose on. And while I think there’s some great creative territory to explore in this notion of space spanning endlessly up, down, left, and right, I also think there are a bunch of other ways to define what an infinite canvas is. Not simply a huge piece of virtual paper, but instead, an elastic space that does things no print surface could do, no matter how big it is. So, herewith, a quick stab at some non-literal takes on the topic. My version, if you will, of six different ways of thinking about the infinite canvas. Ever seen that great short video, “The Power of Ten“? It’s where the shot begins just above two picnickers on a blanket and then proceeds to zoom out so that you see the same picnic blanket, but now from 100 feet up, and then 1,000 feet, and on and on until you’ve got a view from outer space. (After the zoom out, the process reverses, and you end up getting increasingly microscopic glimpses of the blanket, its fabric, the individual strands of cotton, and so on.) 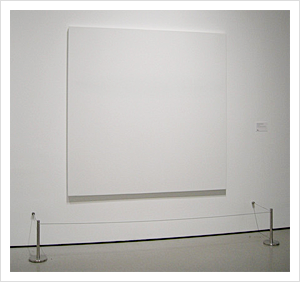 Here’s a presentational canvas that adds new levels of meaning at different magnifications. So, the viewer doesn’t simply move closer or further away, as you might in a room when looking at, say, a person. As you get closer, you see progressively deeper into the body. Microsoft calls this “semantic zooming” (as part of its forthcoming touchscreen-friendly Metro interface). Bible software maker Glo offers some interesting content zooming tools that implement this feature for readers looking to flip between birds-eye and page views. A printed page is a 2-D rectangle of fixed dimensions. On the infinite canvas, the possibilities vary widely, deeply, and as Will Ferrell’s character in “Old School” might say, "in ways we’ve never even heard of." Some possible shapes here: a 3-D cube with content on each side, or pyramid-shaped ebooks (Robert Darnton wrote about those in The New Age of the Book, where he proposes a multi-layered structure for academics with excess material that would bust the bindings of a printed book). I just got a wonderful print book the other day called “Finish This Book.” It contains a collection of fill-in-the-blank and finish-this-thought creative exercises. It reminded me that one thing digital books haven’t yet explored much is leaving space for readers to compose their reactions. Sure, every ebook reader today lets you take notes, but as I’ve written before, these systems are pale replicas of the rich, reader-friendly note taking experiences we get in print books. Job No. 1 is solving those shortcomings, but then imagine the possibilities if digital books are designed to allow readers to compose extensive thoughts and reactions. Print book lovers (I’m one of ’em) wax on about their beloved format’s special talents: the smell, the feel, its nap-friendly weight. But touchscreen fans can play that game, too. Recall, for starters, the first time you tapped an iPhone or similarly modern touchscreen. Admit it: the way it felt to pinch, swipe, flick, and spread … those gestures introduce a whole new pleasure palette. Reading and books have heretofore primarily been a visual medium: you look and ponder what’s inside. Now, as we enter the age of touchscreen documents, content becomes a feast for our fingers as much as our eyes. Authors, publishers, and designers are just beginning to appreciate this opportunity, making good examples hard to point to. I do think that Erik Loyer is among the most interesting innovators with his Strange Rain app, a kind of mashup between short fiction and those particle visualizers like Uzu. It’s not civilian-friendly yet, I don’t think, but it points the way for artists interested in incorporating touch into their creations. A movable viewport lets your audience pan across massive content panoramas. Some of the possibilities here are photographic (Photosynth, Virtual History ROMA). Others have begun to explore massively wide content landscapes, such as timelines (History of Jazz). One new example I just learned about yesterday: London Unfurled for iPad, a hand-illustrated pair of 37-foot long drawings of every building on the River Thames between Hammersmith Bridge and Millennium Dome, complete with tappable backstories on most of the architecture that’s on display. These are just a few of the possibilities that I’ve spotted. What comes to mind when you think about the infinite canvas?